The Subaru Outback 3.6R is one of the best cars I have driven. It has a lot of power, nice ride hight with very car like handling. The amount of features on offer here is extensive. The amount of buttons on the steering wheel and dash are confronting but I had no issue using them when needed. The EyeSight system works extremely well. I didn’t notice I was such a bad driver, it was beeping at me that many times, but it offers peace of mind. The adaptive cruise control is great even in traffic and stop start traffic. Mentioning stop start traffic, there is no auto stop start in the V6 outback. The auto high beam feature simply just works. When there was an oncoming car, the high beams turned off instantly with no delay with out blinding the other car at all, very impressive. The infotainment system is one of the best I think. Clean and simple to use, although the voice control takes too long to do things. The first thing you notice when you start driving the Outback, is the responsiveness when you lightly press the accelerator. Smooth acceleration and very responsive down low. When you keep putting your foot down, it is not as quick as when accelerating from slower speeds but its still pretty quick. Very quiet cabin and a very solid car. It glides over bumps and pot holes and is a very smooth car to drive. The CVT transmission is very impressive for a CVT. I had no issue with it, although you do notice it’s a CVT – not that it’s that bad. The fuel economy is a little high, Subaru claim 9.9L/100kms, I saw 12.4L/100kms which is a lot higher than the 2.5L Outback models. Although the performance you get is worth the trade off. The amount of space in the Outback is very impressive. The rear leg room is massive and the boot is huge. 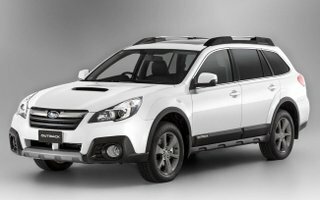 Being drafted to the back of an outback would be the best I think, the leg room is that good, and the addition of rear air vents. The Subaru Outback 3.6R is one of the best cars I’ve driven. The power, driving dynamics, space, technology and value for money. Although fuel costs may be high with the V6 model, and servicing twice a year and much higher than competitors, it’s not the cheapest to own. The warranty being 3 years is a little behind competitors, but still Subaru reliability is pretty good. Although one of the best cars I’ve driven, the only thing that lets me down massively, is the ownership costs. But if you can oversee them, the Subaru Outback is well worth it.